HOT! The Tifosi Pave is designed to perform and features an interachangeable 3 lense system to meet varying light conditions. The Tifosi Pave is constructed from a high strenth Grilamid TR-90 material and are practially indestructible, but are also built for comfort with their lightweight design. 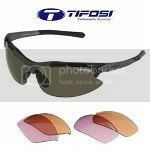 No wonder Tifosi Sunglasses are a leader in the clubhouse … they work! You Save $19.96 & Shipping Charges.